You don’t have to live in an extremely sunny location, such as Arizona, New Mexico, or California, to get the benefits of solar power at home, although residents of those states are certainly a great fit for solar. But as demonstrated in some of the leading solar states, such as New Jersey, your location doesn’t have to be in a place typically thought of as a ‘sunshine’ state to take advantage of solar electric systems. And northern states, including those with potentially heavy winter snow cover, such as Wisconsin, are actually great places to go solar. One case in point is Michigan, where high electricity rates can make for a quicker payback on the cost of home solar, and ready access can be had to solar incentives ranging from tax credits to net metering to low-interest loans or $0 down leases. Going solar in Michigan can make big economic sense, not only in terms of boosting your home’s value and decreasing your home energy bills, but also as an investment that can continue to pay off for decades. Thanks to the hard work of Abhil Ashkantamneni, a PhD Candidate in Computer Science at Michigan Tech and a solar advocate, if you’re a Michigan resident, and curious about calculating the return on investment for a home solar system there, his Michigan Solar Calculator might be the best way to begin. 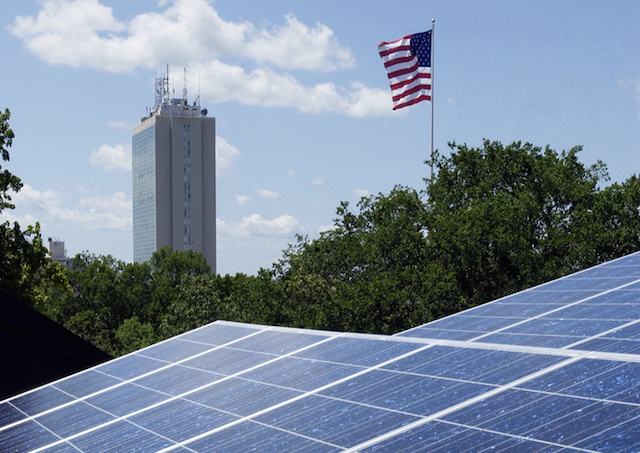 “One of the nation’s highest electricity rates means Houghton is by far the best place in America to install solar panels. In Michigan, there aren’t any current state solar rebates available, but solar incentives do include the standard federal 30% Residential Renewable Energy Tax Credit, and on the state level, a strong net-metering system allows continuous month-to-month rollover of surplus electricity. As part of the MI Solar Works initiative, zero down financing is also available through Michigan Saves to qualified homeowners, which could be the means to get a home solar system installed without an upfront cash outlay and with affordable terms. Join the Michigan solar revolution!